The TRAILER SAILER 24 was designed, as its name suggests as cruising sailboat that is easy to trailer. Her unique features include a sail rig that is easy to setup and lower with out herculean efforts or A frames and guy wires to get tangled up. Her main mast is on a tabernacle for one person to raise and lower. In spite of the rigs simplicity, it is well proportioned and will perform well on all points of sail. She has leeboards to provide shallow draft capabilities and another ease of trailering feature; however, down below is where the benefits pay off. There is ample room for a family or two couples to spread out. The raised deck also will provide a roomy feeling. Similarly, there is plenty of room in the spacious cockpit. The leeboards are designed to be easy to handle on all points of sail and are very efficient shape for windward sailing. Her raised deck, low rig and water ballast provide very good stability characteristics. Construction is light but strong, plywood and epoxy. She has a strip planked bilge radius to make her faster, less likely to slap the bottom forward in a chop, and good looking too. 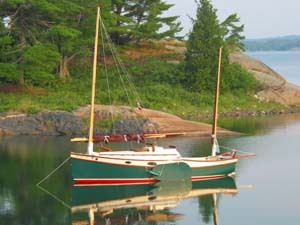 Build her and trailer her to the Keys, Chesapeake, Maine, San Jan Islands or to your local waters for fun and adventure. Estimated cost for quality construction materials (not including power or sails) is $20000. This cost includes a high level of outfit and finish you can be proud of after putting the effort into building this fine boat. Purchase and Download Study Plans for the TRAILER SAILER 24 for $5.00 in PDF format (zipped file). 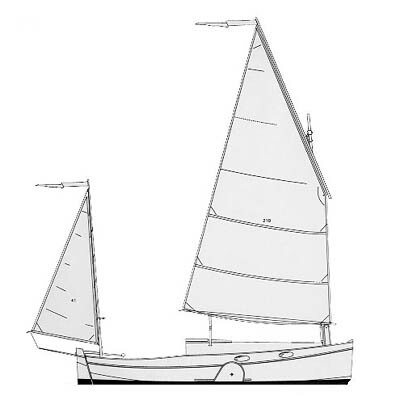 Purchase Construction Plans for the TRAILER SAILER 24 for $240.00 for delivery by US Postal Service. Purchase Full Size Frame Lofting for the TRAILER SAILER 24 for $160.00 for delivery by US Postal Service.